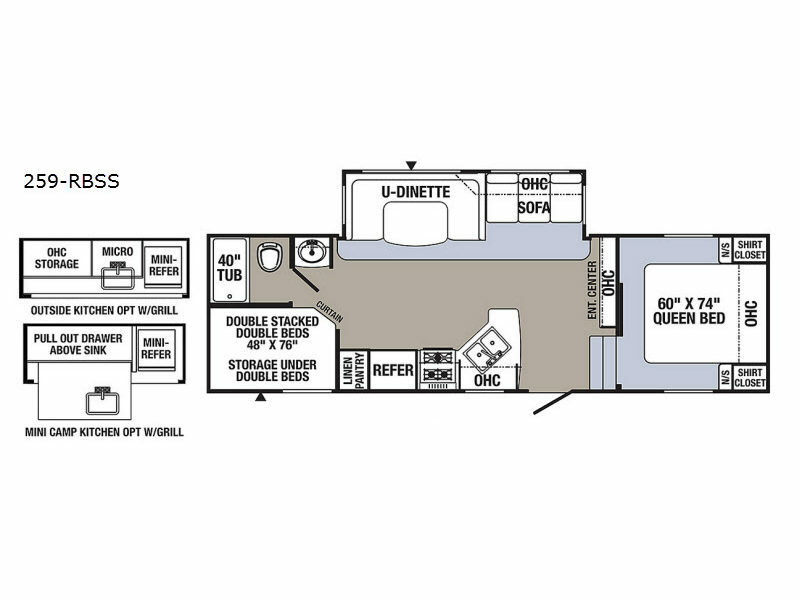 The large single slide Palomino Puma 259-RBSS fifth wheel features a set of rear double stacked double beds that the kids and guests are sure to enjoy. Plus there is storage under the beds for more camping gear, and a privacy curtain. The opposite rear corner has a private area with a 40" tub and toilet. A vanity sink and medicine cabinet are just outside the door. Continuing around, a generous slide out features a u-shaped dinette and a sofa with overhead cabinets. An entertainment center and overhead cabinets are on the wall shared with the bedroom. The wall opposite the slide features the kitchen. 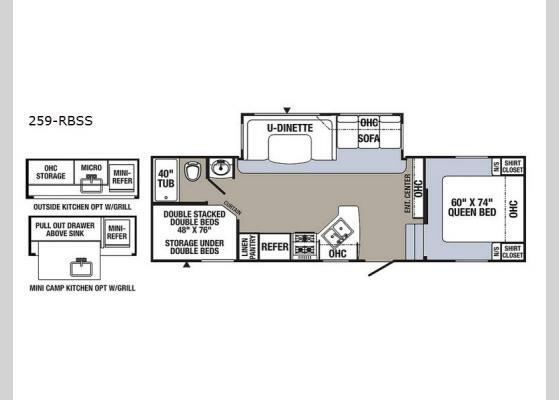 It includes a linen/pantry closet, refrigerator, three burner range, overhead cabinets, and angled double sink. As you step up into the front bedroom, there is a queen bed. Each side has a shirt closet over a nightstand with overhead cabinets between them. Outdoors you can fix meals or snacks on the optional mini camp kitchen that has a pullout drawer above the sink, a mini-frig, and a grill. Or you can choose the optional outside kitchen with a grill, microwave, overhead cabinet, mini-frig, and additional storage.